Before creating a usage plan, make sure that you've set up the desired API keys. 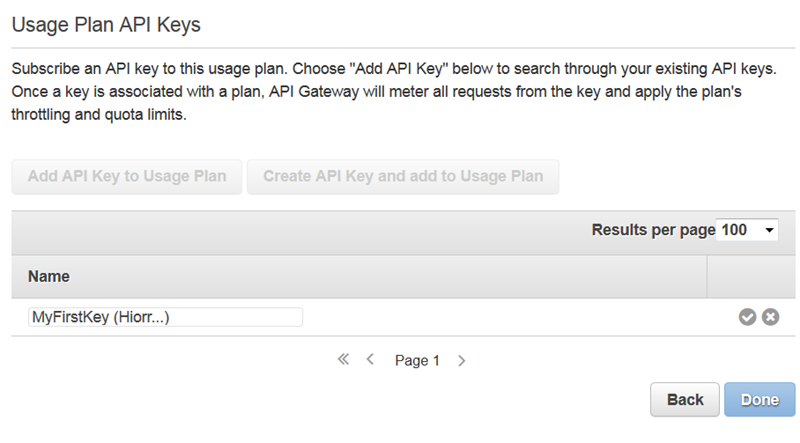 For more information, see Set Up API Keys Using the API Gateway Console. This section describes how to create and use a usage plan by using the API Gateway console. If you started to use API Gateway after the usage plans feature was rolled out on August 11, 2016, you will automatically have usage plans enabled for you in all supported regions. If you started to use API Gateway before that date, you may need to migrate to default usage plans. You'll be prompted with the Enable Usage Plans option before using usage plans for the first time in the selected region. When you enable this option, you have default usage plans created for every unique API stage that's associated with existing API keys. In the default usage plan, no throttle or quota limits are set initially, and the associations between the API keys and API stages are copied to the usage plans. The API behaves the same as before. However, you must use the UsagePlan apiStages property to associate specified API stage values (apiId and stage) with included API keys (via UsagePlanKey), instead of using the ApiKey stageKeys property. To check whether you've already migrated to default usage plans, use the get-account CLI command. In the command output, the features list will include an entry of "UsagePlans" when usage plans are enabled. Call this CLI command: update-account. The following procedure describes how to create a usage plan. 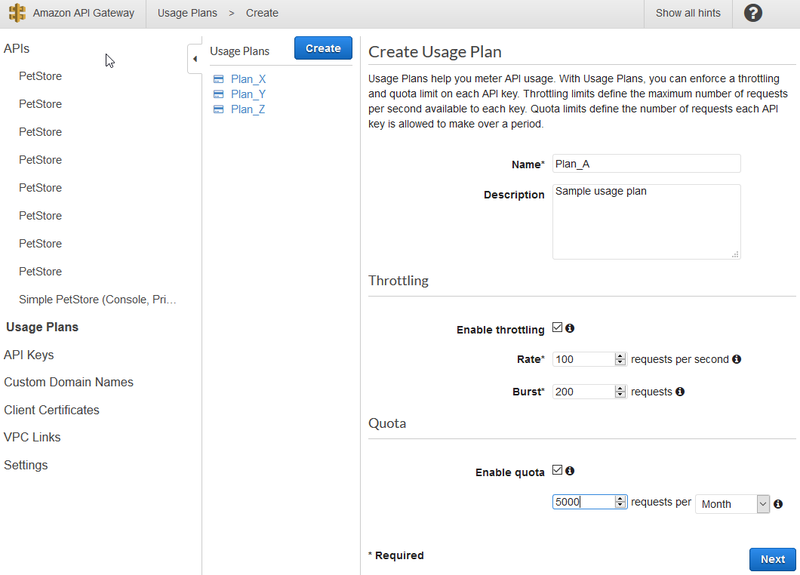 In the Amazon API Gateway main navigation pane, choose Usage Plans, and then choose Create. For Name, type a name for your plan (for example, Plan_A). For Description, type a description for your plan. Select Enable throttling, and set Rate (for example, 100) and Burst (for example, 200). Choose Enable quota, and set its limit (for example, 5000) for a selected time interval (for example, Month). Choose an API (for example, PetStore) from the API drop-down list. Choose a stage (for example, Stage_1) from the Stage drop-down list. Choose the checkmark icon to save. Choose the resource from the Resource drop-down menu. Choose the method from the Method drop-down menu. Set Rate (requests per second) (for example, 100) and Burst (for example, 200). To use an existing key, choose Add API Key to Usage Plan. For Name, type a name for the key you want to add (for example, MyFirstKey). As needed, repeat the preceding steps to add other existing API keys to this usage plan. Alternatively, to create a new API key and add it to the usage plan, choose Create API Key and add to Usage Plan and follow the instructions. An API key can be associated with more than one usage plan. A usage plan can be associated with more than one stage. However, a given API key can only be associated with one usage plan for each stage of your API. To finish creating the usage plan, choose Done. If you want to add more API stages to the usage plan, choose Add API Stage to repeat the preceding steps. To test the usage plan, you can use an AWS SDK, AWS CLI, or a REST API client like Postman. For an example of using Postman to test the usage plan, see Test Usage Plans. Maintaining a usage plan involves monitoring the used and remaining quotas over a given time period and, if needed, extending the remaining quotas by a specified amount. The following procedures describe how to monitor and extend quotas. In the API Gateway main navigation pane, choose Usage Plans. Choose a usage plan from the list of usage plans. From within the specified plan, choose API Keys. Choose an API key, and then choose Usage to view Subscriber's Traffic from the plan you're monitoring. Optionally, choose Export, choose a From date and a To date, choose JSON or CSV for the exported data format, and then choose Export. The following example shows an exported file. The usage data in the example shows the daily usage data for an API client, as identified by the API key (px1KW6...qBazOJH), between August 1, 2016 and August 3, 2016. Each daily usage data shows used and remaining quotas. In this example, the subscriber hasn't used any allotted quotas yet, and the API owner or administrator has reduced the remaining quota from 5000 to 10 on the third day. Repeat steps 1–3 of the previous procedure. In the usage plan pane, choose Extension from the usage plan window. Type a number for the Remaining request quotas.